Just about every day we get an e-mail or a phone call from some property owner who is at his or her wits end over falling afoul of some rule, regulation, law, or ordinance. They have exhausted their administrative and legal remedies, sold many of their possessions to fund the fight, or borrowed heavily against their assets and they are out of cash, out of energy and out of hope. In many cases, they face the loss of their property as well and left penniless on the street. Why? Too many laws! Or they look out their window and see a bunch of government agents trespassing all over their land ….. without permission. Or they receive a notice in the mail that they have violated some ordinance and if they don’t fix the violation immediately they could face fines ranging as high as $75,000 per day. Don’t laugh! The EPA just fined a Wyoming landowner for violating the Clean Water Act and assessed that penalty in spite of the fact a penalty this high violates the 8th Amendment against excessive fines. The landowner had all the necessary permits to do what he was doing but the EPA wasn’t buying it. 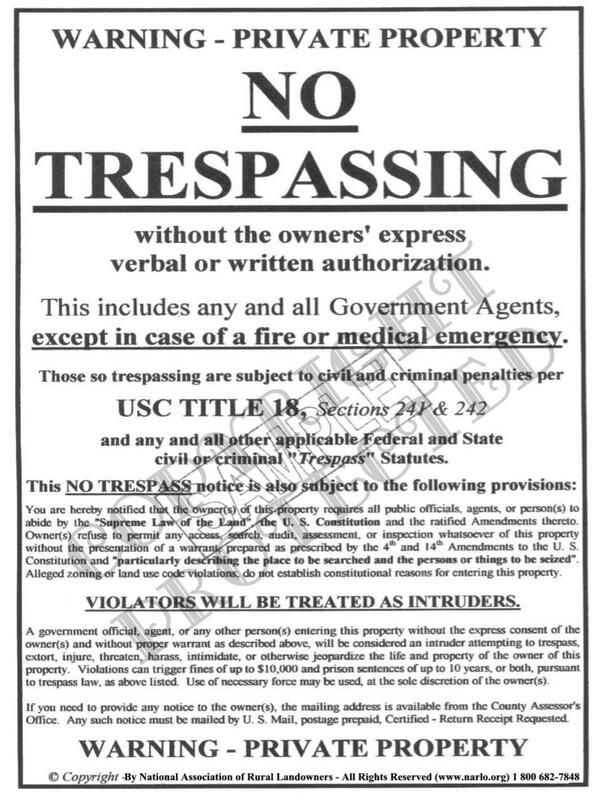 Just the other day we received a call, first from a sheriff in a rural county of Washington State inquiring about the legality of our "No Trespassing Signs" because his deputy tried to serve a summons on a property owner who had installed one of our signs on his land and wouldn’t let the sheriff on the property. We talked to the sheriff for about 15 minutes about property rights and trespass law. The sheriff was all for property rights and was very sympathetic for the property owner. But the sheriff had a duty to perform that was authorized by the court and he had to fulfill that duty. Several minutes after talking to the sheriff we got a call from the distressed property owner and his story was heart wrenching. He had reached the end of his rope and wasn’t about to take any more guff from the government. It seems he purchased property on the Columbia River back in the 90’s and had performed some improvements on the land. He had asked the county if he needed a permit and they told him no. Unfortunately, the property owner didn’t get it in writing. Next he went to a public hearing on proposed changes to the Shorelines Management Act and there, the speaker told the audience that it would not affect current property owners, as they would be grandfathered. Shortly after the public hearing the owner was served with a notice that he was in violation of the very ordinances he was told would not affect his property. He appealed the decision to the hearing examiner and was denied. He went to superior court where he lost. He went to the court of appeals and lost again. Grandfathering meant nothing and the county was out to make an example of him. The landowners spent all of their money, borrowed more and were broke. The man’s wife had a nervous breakdown. Unfortunately, this is not an uncommon occurrence when coming up against an intransigent government agency. This property owner became a victim of too many laws, rules, regulations and ordinances, as are millions upon millions of Americans today. He was also the victim of government arrogance and abuse for which there is little defense under our current system. For over 230 years American law and rule makers have layered law on top of law, rule on top of rule, regulation on top of regulation and ordinance on top of ordinance. These laws, rules, regulations and ordinances, local, state, and federal, amount to millions of individual laws. Each law comes with its own brand of enforcement for violations, including serious fines and jail time. The net result of all these laws is, every American is a lawbreaker in one form of another and they don’t even know it. But if they are caught in an innocent violation of one or more of these laws or rules, ignorance of the law is not a defense and they pay the price. Now, to add insult to injury, the government ignores the laws they write, but levies huge fines and penalties on those who violate the very laws government ignores. And what’s even worse than that, the laws are so complex and contradictory they are fertile fields for low-life lawyers to line their pockets with millions of taxpayer dollars from lawsuits against the government for not complying with their own laws. The environmental lawyers are the worst of the bunch. So what has happened is a once-free country, governed by the rule of law and not of men, has become a country with so many laws that government uses those laws against the people to enslave them. Individual liberty has become meaningless. Free choice is the dream of the about to go insane. What is driving all these laws? Two things are the culprits. 1) Lawmakers have to make laws. That is what they see as their duty and they aren’t happy unless they are making laws. 2) An anti-American social justice and radical environmental agenda, created mostly by the socialists in the United Nations, but championed to the point of obsession by the American left, are driving most new laws. It begs the question, how in the devil are the people going to unravel the millions of rules and laws that have morphed America into what can only be described as an emerging Banana Republic? Which laws are you going to unravel? Which bureaucracies are you going to eliminate? Which bankrupt government program are you going to repeal? Who is going to be fired? How will you reform the public school system from one of social and environmental indoctrination, to one of meaningful, truthful and objective education? How are you going to stop crony capitalism? And how are you going to do it when tens of millions of Americans are “hooked” on those government programs and will vote out any politician that even suggests repealing them. Look at all of our colleges today. They are infected with socialist professors teaching college kids how to be good little compliant socialists. What did we expect would happen with an openly stacked deck of socialism in our institutions? But better yet, who is going to change government? Government certainly isn’t going to do it as is evidenced by the current scandals where no one is held accountable. That only leaves the people, but do they have the will and the courage it will take to do it? So far there is no evidence that they do. Oh sure, there are a few mal contents (that’s what the government calls them, or Tea Party for short) that are making trouble but they will be easily put down by a government that has become completely militarized. Talk isn’t going to change anything. Articles aren’t going to change anything. Freedom Conferences aren’t going to change anything. The only sign that something was about to change was when hundreds of “armed people” showed up at the Bundy Ranch in Nevada to oppose 200 fully militarized Bureau of Land Management (BLM) agents in SWAT team gear. As a response to the people’s armed resistance, the BLM stood down, as well they should. We know that determined resistance works so why aren’t Americans using it more often? Other signs of open resistance to BLM agents are armed cattlemen showing up along the Red River in Texas and some isolated locations in New Mexico. Other than that, the American people in general seem cowed by government. However, the way that government is behaving, from the scandals of the Fast and Furious gun running by government agents, the Benghazi blatant cover up, IRS arrogance and flaunting of the law and government oversight, a whole host of out of control government bureaucracies, NSA spying on every American, open borders bringing us an illegal alien invasion, the move to one world order and Obama’s overreach of presidential authority, skirmishes like the Bundy ranch and others will begin to show up in little pockets of resistance all over America, until they erupt into a full fledged conflagration on its way to outright armed insurrection or civil war. If the pockets of armed insurrection aren’t large enough, they will be put down post haste by a powerful central government that has no intentions of losing dictatorial control over the people. So we ask ladies and gentlemen, in today’s world, what does freedom look like? Sure we say less government, lower taxes, less regulation, along with fair capitalism and free markets, but how do we get there when we have come so far the wrong way? That is the $64,000 question that so far, no one has answered. What catalyst will trigger an uprising? What action by government will send the people into the streets by the millions saying, “we aren’t going to take it any more?” What charismatic leader will come along and coalesce the people into a unified force for freedom? These questions have yet to be answered as the government grows more powerful each day and America becomes just like all the other Banana Republics in Central and South America, only much bigger, much more powerful and much more deadly.